Anyone who knows how? I could see 2 connections at the volume controll at 1 of the pics but... dont know how to do? anyone who can help me out? Neo Geo is just plain awesomeness.. gotta love it! Sure it's possible to get stereo from the MV-1FZ as the op amp C844G still outputs separate audio channels. I did this to my MV-1B. ok... could you explain a little more? Is it the same on 1B as on 1FZ?? I am also interested in seeing how this is done, I was under the impression that the YM2610 outputed single channel data to the DAC. Thought I saw logic for mono or stereo options on the processor. Are we saying the YM3016 DAC outputs stereo even on a mono board (or some versions), then the analog L & R is combined for mono to the output stage ?? I will double check my work as I've only consolized one MV-1FZ in the past and I may have made some assumptions on the audio circuit that may hold true on the AES, but not on the MV-1FZ -vs- other MVS boards... The 1FZ that I consolized and sold is on the way back to me because of some graphic glitches (rough shipping?). Once it is here, I will examine the audio circuit closer. In either case, the YM3016 DAC (according to the pinout) has two channel output. Great! Im buying a 1FZ slot now, and wait for your instructions! I'm of to Phoenix, AZ for the weekend so I won't be able to check this out until I get back on Tuesday. I will double check my work as I've only consolized one MV-1FZ in the past and I may have made some assumptions on the audio circuit that may hold true on the AES, but not on the MV-1FZ -vs- other MVS boards... .
sounds good... for my new MV1FZ is in the mail now! on the way to me! The YM2610 also has an audio channel that is used for tones, such as credit entry and character select tones (really dependent upon the individual game I guess)... This is mixed with the left and right channel outputs from the YM3016 DAC via a couple caps and resistors. I should have this done tonight and can post pics for those that are interested. I do want to recreate this schematic with Visio or something and make a PDF, but my copy of the schematic is a copy of a copy of a copy, etc. so some of the labels are very hard to read. I may have to locate a 1F board so that I have something to help while I recreate this document. 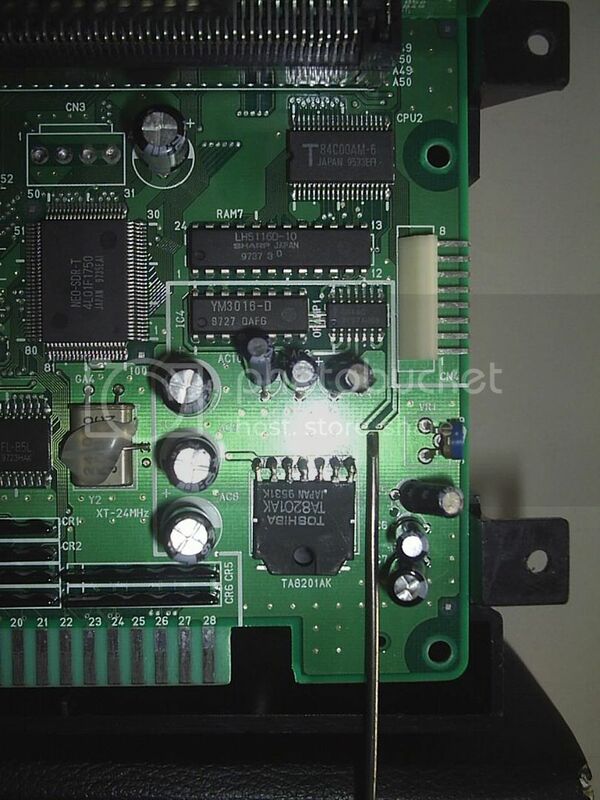 while C is just pin 27 of the YM2610 sound generator, which on the MV-1B is located on the slot board. 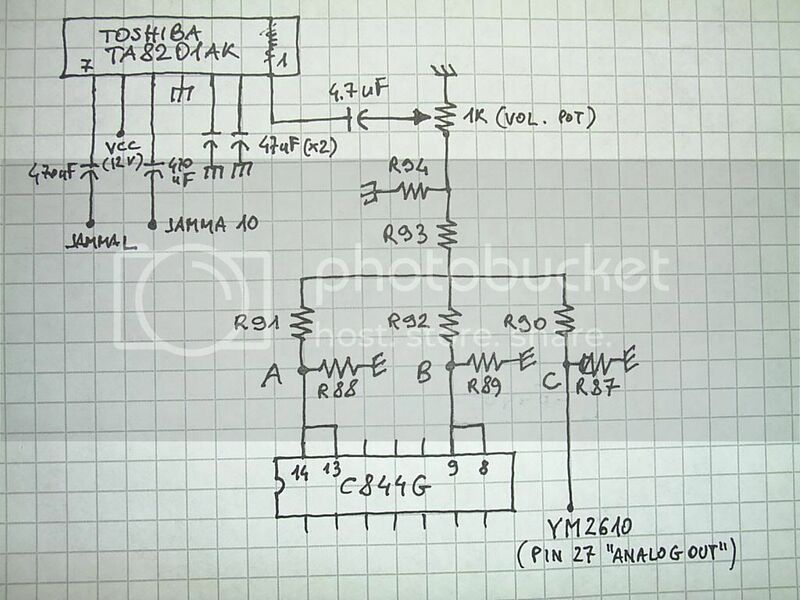 Just build a simple amp with generic purpose NPN transistors and have ABC through it and you'll have stereo sound at a decent output. MV-1FZ, MV-1A and MV-1B share the same sound circuit so what holds for one also holds for the others. I have that 1FZ back for the moment and I am updating it for the buyer. The previous mod wasn't 100% as it was missing the audio channel from the YM2610. I totally overlooked it (D'oh!). On closer inspection of the 1FZ, I saw that the audio from the YM2016 is merged after the left/right channels are summed, which is why I am removing a couple resistors to "break" that sum on the stereo channels so that I don't have to cut traces, then adding the YM2016 audio channel into the left and right channels independently. Thanks MKL, it's nice to know that the 1B and 1A share the same circuit -- I don't have them to look at. Last edited by JMKurtz; 01-13-2005 at 07:55 AM.